Saturday, April 20 1-5 p.m.
Don’t toss it. Let’s fix it. Join us for a FREE do-it-together event. Bring your broken electronics, small household appliances, clothing, toys and more. We’ll provide workspace, specialty tools, and guidance to help you disassemble, troubleshoot and, if possible, repair your item. Whether you fix it or not, you’ll learn more about how it was manufactured and how it worked. And maybe you’ll be inspired to become a Fix It Coach yourself! Items must be small enough to carry, and no more than 3 per person. Attendees are required to stay with their item. Know how to fix things? 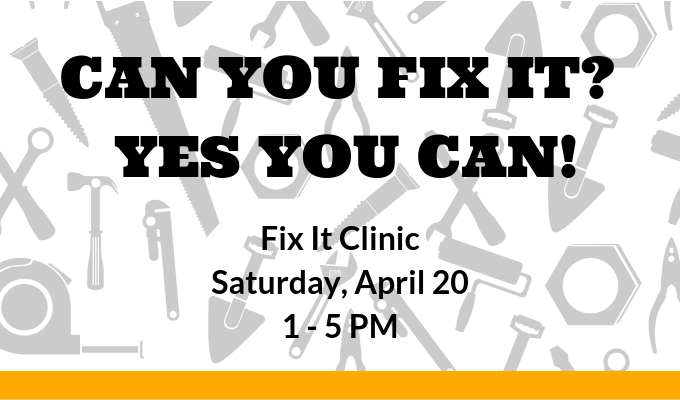 Use your skills at a Fix It Clinic. Volunteer today! Do you have other do-it-yourself projects? Check out these books to guide you through fixing just about anything!